Today is my dad’s birthday. Or at least it would have been had he not died twenty years ago. But it’s still his birthday, right? I don’t remember the exact deathdates of the people I love who die, but I always, always remember their birthdates. One day, I’ll tell you about my dad. Happy birthday, Dad. This one’s for you. As much as I like to champion local bands, ODESZA doesn’t need my help. These guys are well on their way, having recently headlined Bumbershoot and presently in the midst of a successful arena tour. My only regret is having missed the chance to see them live on their way up. Also, can we talk about drumlines? ODESZA incorporates a drumline in their live shows, which I find both intriguing and frightening. Drumlines have forever evoked heady emotion in me. High school football games were always a bit of an emotional ordeal as tears filled my eyes at the first beat of the bass drum. I’d either hide behind sunglasses or mutter something about allergies as I wiped my face and struggled to keep from sobbing. Not even kidding. Please tell me this has happened to you. Beyond drumlines, though, take a minute and put a bit of ODESZA on your latest playlist and realize that Seattle is ripe with musical talent that reaches beyond the likes of Macklemore and Pearl Jam and Death Cab For Cutie. They’re all good, but these two guys from a little college in Bellingham–ODESZA–are at the top of their game. I love the ritual of tradition and one of my longest-standing traditions was to bake a special “back to school” cake every first day of school. It was always strawberry cake. Pepto-Bismol pink, made with a box of white cake mix and a box of strawberry jello. Sure, there were some real pureed strawberries mixed in the batter and the frosting, but mostly, it came from a box. Had it not been so wonderfully delicious, I would have eschewed the boxes in favor of something more homemade, but, tradition. It had to be strawberry cake. When the kids were in elementary school, we’d invite their besties to walk home with them after the first day and join us in the ceremonial cutting of the cake. They’d all sit around, sugar-high and giddy from the first day back at school and dish on their newest teachers and classmates. Priceless. The University of Washington began classes this past Wednesday–so very late in September that I nearly forgot all about strawberry cake. My daughter, now living in the dorms as a college freshman and my son, graduated from all schools and working at the Seattle Times, I had no kids at home to bake for. Well, what the hell do I do now? (Pretty much a constant question of mine lately.) My son suggested I bake the strawberry cake and then tour Seattle, dropping off paper plates of pink cake to both he and my daughter and perhaps a few of their pals. Meh. I wasn’t feeling it. Maybe it was time to put the strawberry cake in our rearview mirror. So, I was browsing one of my favorite baking sites (King Arthur Flour) and happened upon a recipe that sparked my interest, Old-Fashioned Apple Cake with Brown Sugar Frosting. You don’t get much more fall-ish than apples and the brown sugar frosting sounded like a magnificent match for a moist, apple-packed homemade cake. No jello, no boxed cake mix necessary. But what really sold me was the multitude of reviews that sung this cake’s praises as if it were manna from heaven. I don’t care if I’m shopping on Amazon or baking a cake, the reviews are where it’s at. Manna from heaven, indeed. This cake is a keeper. Packed with three cups of diced apples, (I used Honeycrisp) it is one fantastic forkful of fruit after another. The frosting–not quite a buttercream but thicker than a glaze, goes on warm and cools to a smooth layer of brown-sugared brilliance. If I had three thumbs, I’d use the extra digit for emphasis, but since I don’t we’ll just call this a solid two-thumbs up. The next day, I packaged up a container filled with apple cake and delivered it to my daughter’s dorm. It wasn’t pink, but it will do. So many labels. Contradictions. We all have them, we all wear them. Our bodies carry them, sometimes outwardly, emblazoned across our skin, either with pride or shame. Most of them embedded so deeply into our psyche that it would take years of excavation to unearth and free these from our flesh. Something your teacher said. A coach. Your place, your station, your labels within your family of origin. Those names, the labels spat out in the heat of an argument. An epithet proclaimed in passion. I’ve been labeled all of these at some point during my life. Energy expended and precious time–years of my life–invested in making myself “just right”. I wanted to be just right. I mean, don’t we all? A place of love, a place of fitting in, of belonging. A tribe. A collective where the lushness of our contradictions are celebrated. If you’re lucky, a funny thing happens as you get older–you run out of fucks to give. You run out of all the fucks and in a moment of blazing clarity, you realize that the labels given to you are merely a means by which others seek to control, contort and fit you into a box that makes them more comfortable. I bet you’ve done that to someone you love. And I bet someone you love has done it to you. Not everyone is lucky, though. I’ve known many older people who take their last breath believing that they needed to have been better. That their too-muchness was not enough. I am not that person. At least not anymore. So I wear this shirt. A shirt I had custom made, a label of my own making. As I do this, I take back the power of Too Much and I celebrate all the contradictions of me. I am too much. A little bit extra. Sometimes a lot extra. 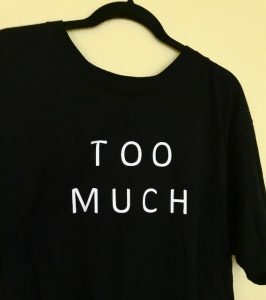 More than enough.